I may be the Mr. Clean Magic Eraser‘s biggest fan. No one would ever accuse me of being a neat freak, but I’m not a slob either. I fall more in the middle and my claim is that if I wasn’t working 80 hours a week, cleanliness would be much more of a priority! I think I love Magic Erasers because they make cleaning pretty much anything easier. I’m all for anything that makes keeping our place presentable easier. Originally, I used them for the usual things – un-scrambling egg pans, making our kitchen sink shiny, and cleaning our counters after a particularly sticky batch of pie filling. 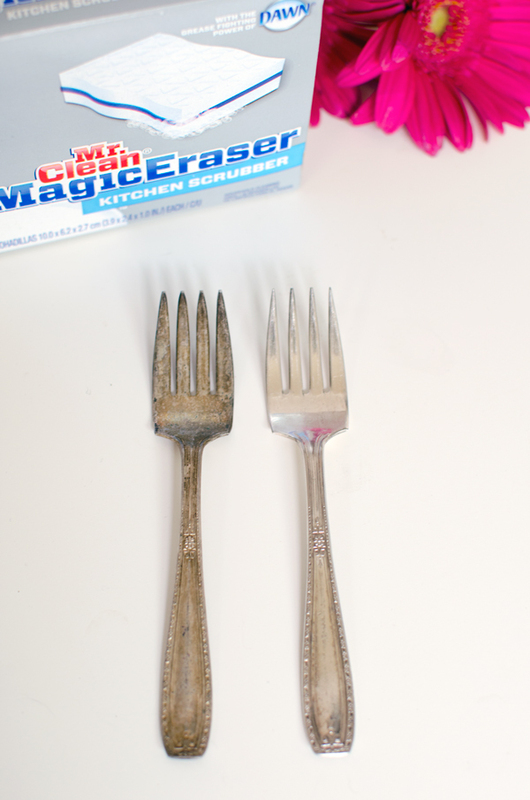 Lately though, I’ve realized that there are so many more uses for my Magic Eraser outside of the kitchen! 1. Making my laptop look like new. Let’s face it, as a blogger, I’m constantly using my computer on the go. It definitely shows – on any given day it looks more like a dinner plate than an actual computer. I just lightly mist a magic eraser and gently buff away any marks. It’s important that your computer is completely powered down when you clean it and you use just the tiniest bit of water. It works on the cord too! 2. Making shoes white again. 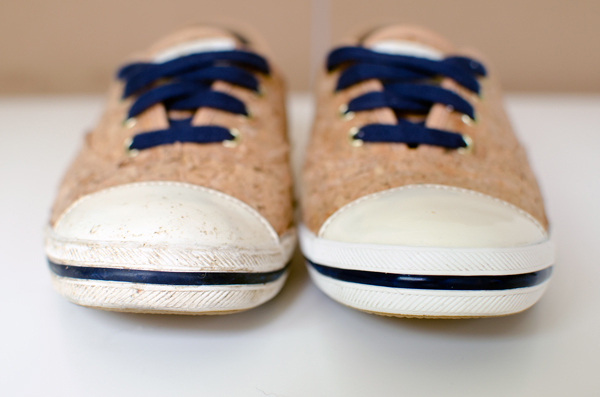 The Magic Eraser easily lifts dirt from even the smallest crevices, like my favorite Kate Spade + Keds collab cork sneakers that got all muddy when I did outdoor yoga in wine country. 3. Polishing silverware. One of my favorite flea market finds is mismatched vintage silverware. Sometimes I photograph it tarnished and worn-looking, but it’s nice to have the option to tidy them up and even – gasp – actually eat with them! I love that it polishes without having to use any unnatural chemicals. 4. Removing labels from Starbucks bottles. 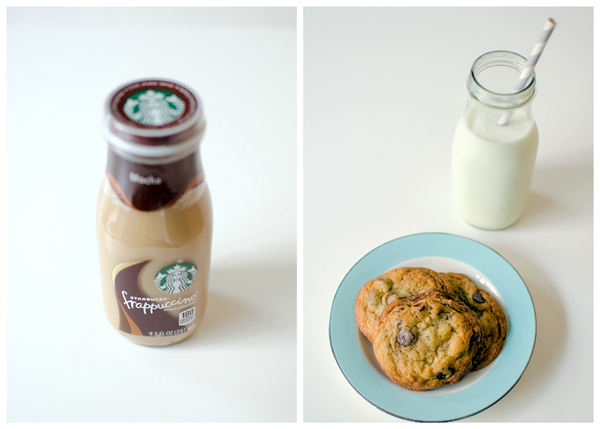 Starbucks bottles are the ultimate blogging prop. Without the branding, they look like little milk bottles and are just begging to be filled with milk and a paper straw. I have a crateful that I pull out for parties (just use a pretty piece of washi tape and write each guest’s name on it). The labels peel off easily enough, especially if you have fingernails. The problem is there is this nasty adhesive underneath that won’t come off no matter how much you scrub. That’s where the Magic Eraser comes in handy. Same goes for those annoying stickers that come on new dishware and glassware. 5. Last but not least, making everything in my house white again. 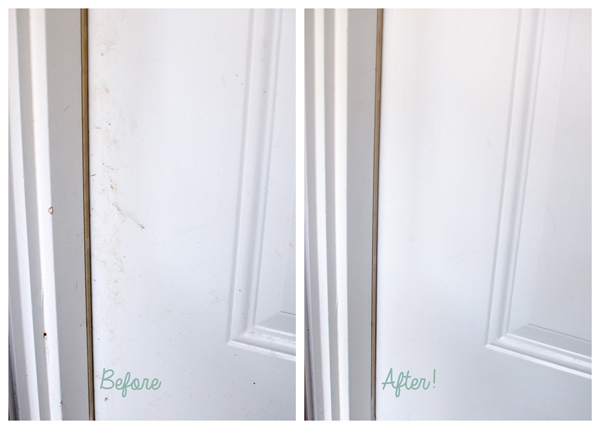 Everything from dog nose prints and dirty fingerprints on a door (case below) to coffee rings to scuff marks. All handled with a few swipes of my Magic Eraser! 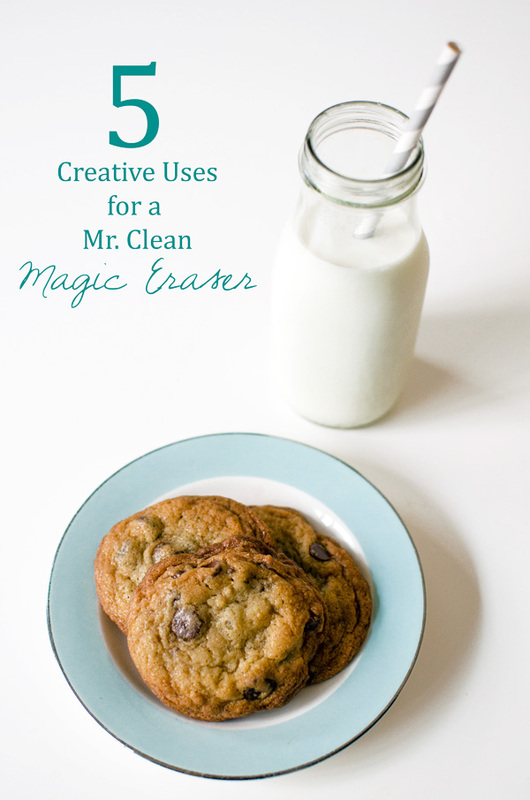 We love the Mr Clean Magic Erasers too! My wife uses them for everything. One of her favorites is to cut off a 1 inch wide piece and place it into the toilet while we are on vacation, keep the toilet clean, bowl white and no ring! 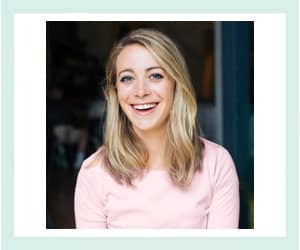 I’ve heard of that but it seems too good to be true! I’m definitely going to try it though! How perfect!! Definitely have to give this a try on my computer and computer charger!!! You should! 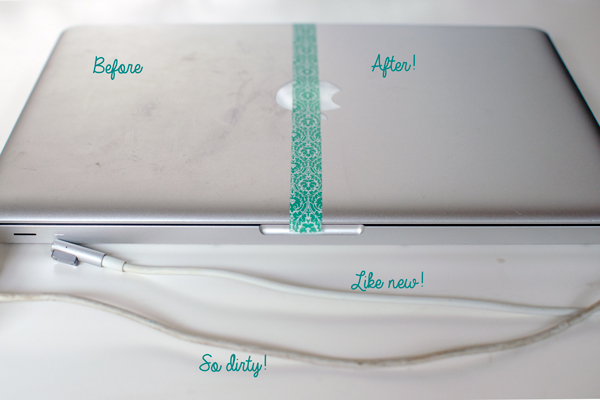 It’s such an easy way to get rid of all that grime! Ok, I’m sold. Every time I see these in the store, I want to buy them. But then I always figure that something else I have at home (some spray cleaner and a rag) will do just as good. So I skip them…but I’m totally buying a box now. They are absolutely my fave! I promise they will make cleaning so much easier! My husband and I both love these things. Especially to remove crayon marks off the walls. I was surprised to see about it removing tarnish from silver. I have a silver ice bucket a friend gave me. It was tarnished then. I will have to try this idea. Glad to hear you’re a fan of these magical little things too Pam! I’m glad I added to your cleaning power! I had no idea they were THIS handy! sometimes I feel the sticky stuff on adorable jars is my nemesis. You are TOO funny! Happy to help in your pursuit of cute. What?! That’s crazy, I had no clue it worked like that. I just may have to try it out. I have tons of stuff to use it on right now!